This was the final academic essay I wrote in my seminary career. No lie. I turned this in, and got an “A” and a Master’s degree. Please enjoy! Growing up in the Pentecostal church, I heard my church leaders say strong words against most sci-fi and fantasy media. They made their strongest objections against fantasy works that emphasized witchcraft as a plot point, especially the Harry Potter series. When I began struggling with doubts about my Christian faith, however, one of the outlets in which I found solace and even inspiration concerning faith matters was through the medium of sci-fi and fantasy media. These mediums held my questions about the universe and also offered answers and insights rooted in the spiritual world. As a result, I began to become more open to the power of the spirit world in my life and the world around me because of the space made to imagine new ways of living a life of faith as demonstrated by these shows. One of those influential outlets was a show called Buffy the Vampire Slayer. This show is the story of a young woman, Buffy, who is the “chosen one,” who “alone will stand against the vampires, the demons, and the forces of darkness. She is the slayer.”1 She battles these forces of darkness, but never alone, because she has the help of her Watcher (her trainer and teacher) and her friends, the Scooby Gang. In these tales, she battles evil forces that often serve as metaphors for the trials and tribulations of adolescence and adulthood. She and her group ask existential questions, and more often than not, they do not receive black-and-white answers, which is in alignment with the very gray situations they face. Buffy questions authority and power structures that would have her conform to a patriarchal standard and even topples them. In the series finale of the show, she dismantles the greatest structure of all: the one which makes it so only one Slayer can exist. In a Pentecostal fashion, Buffy unleashes the power granted to her alone to all the potential slayers around the world. After this event, she is no longer truly alone in her destiny to battle evil. I see this as an example of Pentecost on a fantasy show which makes no significant claims to Christianity, at least in an affirming sense. In this essay, I will explain how the activation of all the potential slayers in the series finale of Buffy the Vampire Slayer is an example of Pentecost in sci-fi/fantasy media. The connections are as such: First, at Pentecost, the Holy Spirit landed on the present disciples, and in Buffy, the scythe activated potentials around the world. Second, the Holy Spirit enacted the gift of tongues to the disciples, and the power within the scythe in Buffy activated the potentials, making them true slayers and no longer only potentials. Finally, the power of the Holy Spirit ushered in the birth of the Church, while the activation of the potentials ushered in a new era of Slayers, in which many, not one, had the power. To set up this argument, I will go back several episodes in the final season (Season Seven) and describe how these particular episodes set up the plan for the activation of all the potential slayers. In “Get It Done,” episode fifteen of season seven,2 Buffy meets the Shadow Men, who created the first Slayer and the Slayer line. The Shadow Men explain to Buffy how they infused the original slayer with a demonic essence for their strength and offer this essence to Buffy. She is preparing a small army of potential slayers3 to fight an apocalyptic battle against an entity known as the First Evil, and the Shadow Men know Buffy doubts the strength of the army and herself in defeating this enemy. However, when they try to force the entity into Buffy, she refuses and chastises them for creating the Slayer line in the first place. As the Slayer, she knows how isolating and deadly the role is, but she does not want to continue their way of doing things. To further symbolize this severing of ties with her origins, she breaks the staff through which they summoned the demon.4 Before she leaves, the Shadow Men show her a vision of the Hellmouth5 full of vampires and demons waiting to wreak havoc on Sunnydale and Buffy’s small army of potential slayers. In episode twenty-one of season seven “End of Days,”6 which also serves as the penultimate episode of the series, Buffy finds a scythe in a vineyard guarded by the First Evil and a corrupt pastor named Caleb, who is under the First’s influence. 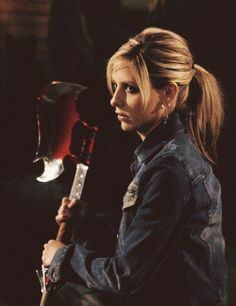 After a brief altercation, Buffy returns home and shows it to the Scooby gang, her Watcher Giles, and fellow Slayer Faith.7 Buffy and Faith both feel an increase in strength from the scythe, and both feel that it is meant for them. Seeking more answers, Buffy returns to the vineyard and is greeted by a female Guardian, the last of a group of women who hid the scythe so a future Slayer would find it and use it for the final battle over the Hellmouth. Before Buffy can talk with her more, the Guardian is killed by Caleb, and a final battle between the two ensues. This unleashing of the power of the scythe in “Chosen” is a Pentecost event. At Pentecost, as recounted in Acts 2, the Holy Spirit landed on the present disciples. While they are gathered in Jerusalem, “a sound like a violent rush of wind”11 fills the place. Then “divided tongues, as of fire, appeared among them, and a tongue rested on each of them.”12 Upon being touched by these tongues of fire, the Holy Spirit fills them and gives them the ability to speak in other languages.13 The Holy Spirit landed on the disciples and changed them. They had taken Jesus’ command to stay in Jerusalem and wait for the Holy Spirit to come to them,14 and at Pentecost, they become empowered to spread the Gospel around the world. They are no longer in waiting but ready to act. In similar ways, the power of the Slayer within the scythe “lands on” all the potentials around the world. In Buffy, the scythe activated potentials around the world, although the manifestation of the strength in the Slayers appeared in a different way than it did to the apostles at Pentecost. The audience first sees the power of the scythe transferring as Willow performs the spell, when “[s]uddenly, she’s overcome with power. She looks up, as the scythe and Willow start to glow with a bright white light.”15 After this scene, there is a flashback to Buffy making her speech to the potentials about her power becoming “our power.” She explains to the potentials how there is only one Slayer in each generation because “a bunch of men who died thousands of years ago made up that rule.”16 However, Buffy quickly points out that Willow is more powerful than those men ever were, and because of Willow’s magical prowess and this powerful scythe, they are going to change the rule. As Buffy’s speech continues, there are clips of young women in various scenarios: the potentials look out at the demons swarming for battle and stand taller and stronger, a young girl at bat in a baseball game starts out looking nervous then smiles confidently, a teenage girls has fallen out of her chair in school after being overcome by her new found strength, and another young woman grabs the wrist of a man trying to slap her.17 The power within the scythe has been unleashed, and the potentials around the world are no longer potentials: they are Slayers. Like the disciples, they no longer need to wait for their strength to come to them. Now, it is made manifest within them. An obvious difference between these two scenarios is how the power is given to each group, the disciples and the potentials. In Acts, the gift of the Holy Spirit is an act of divine initiation, whereas in Buffy, the power is given by human means, or at least from a source outside of the concept of the Christian God. Willow releases the power from the scythe through the power of magic, and while in the mythology of the series this power comes from an outside source, it is initiated by Buffy, Willow, and their friends. However, in both instances, a power traditionally wielded by one or a few is now made available to many. This manifestation of the Holy Spirit is a sign of unity for the disciples and all those who witness the event. It is also symbolic of the work which will be done to bring Gentiles and Jews into community together. At Pentecost, diverse languages are not nullified; instead, unity occurs in the midst of a diversity of languages through the power of the Holy Spirit. According to Acts, some of the following languages present are listed in Acts 2:9-11: “Parthians, Medes, Elamites, and residents of Mesopotamia, Judea and Cappadocia, Pontus and Asia, Phrygia and Pamphylia, Egypt and the parts of Libya belonging to Cyrene, and visitors from Rome, both Jews and proselytes, Cretans and Arabs.” Yet in the midst of this plurality of languages and cultures, communication happens by the power of the Holy Spirit. The mission of the Church sees this unity in the midst of plurality received among diverse communities over long periods of time and in a plurality of cultural settings.”19 At Pentecost, there are multiple tongues offering praises to God, and part of the Church’s mission is to continue bringing different peoples of various languages and cultures together to offer such praises. A Pentecost-like unity occurs in Buffy, but the unity occurs in a sharing of power instead of a sharing of languages. In “Chosen,” Buffy defies both her own supernatural origins and a common theme in superhero tales: only one person can save the world. Instead, she insists “my power should be our power.”20 According to Buffy’s wish, Willow is able to “transfer Buffy’s power to all the potential slayers in the world… [and commence] a religious power that is furthermore disconnected from patriarchy and clearly defined as female.”21 The once-potentials receive the fullness of their powers and are able to fight against the evil entities within the Hellmouth and close this Hellmouth for good. A new line of Slayers begins, in which power is shared by all who are chosen to wield the power instead of a lone warrior. This unity of power is similar to the outpouring of the Holy Spirit at Pentecost, because in a supernatural event, a transference of power is made from one person to many. At Pentecost, the promised Spirit arrives and anoints the disciples for their mission, empowering them to be Christ’s body on earth. This is the arrival of the Great Counselor, who will guide them in all things after Jesus’ ascension. Since Pentecost, Christians have been able to follow Christ because of the gift of the Holy Spirit. Likewise, when Willow’s spell releases the power of the scythe and gives that power to the potentials, all women who can be slayers become slayers. The power resting within them becomes real. Once these manifestations of power occur, from the Holy Spirit and the scythe, a new era begins in each of these stories. The power of the Holy Spirit at Pentecost ushered in the birth of the Church. The activation of the potentials ushered in a new era of Slayers, in which many, not one, had the power. Pentecost is often described as the birthday of the Church. This event was the result of Jesus’ promise to send the Spirit to the disciples if they waited in Jerusalem. The fact that they both waited in Jerusalem and then left to begin the ministry of the Church is significant in itself. Instead of keeping the disciples in Jerusalem, the center of Judaism, Pentecost “leads away from Jerusalem, to a missionary movement scattered to “the ends of the earth;” it decenters (or, at least, portends the decentering of) Jerusalem as the locus of divine worship.”22 The Holy Spirit is not a dormant creature willing to let the disciples remain within the familiarity of Jerusalem. Instead, similar to how it drove Jesus into the wilderness, the Holy Spirit guides the disciples to the Gentiles. In this way, “Pentecost constitutes…a criticism of an ethics of election focused on the privileged place of those who claim by birth to be descendants of Abraham.”23 With the Holy Spirit, any barriers between different peoples are dissolved, but their differences are not nullified. Instead, the different people and cultures are brought together in the Church by the Holy Spirit’s power to bridge communication and cultural gaps. As a result, Pentecost is also “at least an implicit critique of Rome, whose imperial destiny (so it was said) was to “form one body under the name of Romans.””24 The Church is being formed in the image of Christ by the power of the Holy Spirit, not in the image or by the power of any one nation or people. Since the Holy Spirit is forming the Church into Christ’s body on earth, the Spirit is also at work empowering the individuals within the Church to be made in the image of Christ. The gift of tongues is a significant sign of this power. The outpouring of the Spirit makes the Church possible “not by the dissolution of multiple languages but rather by embodiment in a people generated by the Spirit, gathered in the name of Jesus Christ.”25 By maintaining unity in diversity, the Holy Spirit is able to form different individuals into Christ’s image without negating what makes people unique. Pentecost also serves as the fulfillment of Moses’ wish that “all the Lord’s people were prophets” (Num. 11:29; cf. Joel 2:28-29/Acts 2:17-18) and, as such, represents an equipping of the church for its divinely appointed mission.”26 Peter explains in Acts 2:14-26 how the Law and Prophets foresaw this outpouring of the Spirit and the universality of the Spirit’s influence. This is especially evident in Peter’s use of Joel 2:28, in which young and old, and male and female, will receive the Spirit and prophesy freely. This empowerment of the Holy Spirit in bringing unity in language and prophecy equips the Church to be Christ’s body in the world. As the Holy Spirit brought forth the era of the Church, so too did the unleashing of the scythe’s Slayer power usher in a new era of Slayers. Buffy and Faith are no longer the only Slayers in the world. Now, they can share their power with every woman destined to be a Slayer. This sharing of power is a significant tool of empowerment, especially for heroines. Most heroines experience three character traits: “Firstly, sacrificial heroines are made to feel guilty of their positions as heroines. Secondly, they are made to want to give back their power. Finally, the only possible community for them is a patriarchal one.”27 By sharing her power, Buffy subverts these tropes. She no longer feels guilty about her power, she does not want to give it up, and with Willow’s help, she creates a matriarchal community centered on power-sharing instead of power-hoarding. The activation of all Slayers empowers the Slayers as individuals and as a community. The images of the young women receiving their powers during Buffy’s speech shows empowered individual women. The final battle demonstrates what this empowerment looks like in a communal sense. The potentials have a legitimate chance at helping Buffy and Faith, because they are equal to them in strength. Previous episodes saw a deterioration of community, but coming around this plan and receiving power from the scythe united Buffy’s army. There is no longer only one, nor is there only two, to bear the weight of the world. The activation gives the chance for anyone who can be a Slayer to be a Slayer. It is important to notice the Christian story in different genres of media, because Christians need to be reminded that media influences our culture, Christian or otherwise. I chose the medium of Buffy the Vampire Slayer for its spiritual elements and because of the Pentecost event in the series finale. Making these connections between biblical text and popular culture helps Christians to better understand the demographics and language of our culture, because in order to understand the people not in the Church, it is first important to understand the stories that influence them. Buffy the Vampire Slayer. “Chosen.” UPN. May 20, 2003. Written and directed by Joss Whedon. Buffy the Vampire Slayer. “End of Days.” UPN. May 13, 2003. Written by Douglas Petrie and Jane Espenson. Directed by Marita Grabiak. Buffy the Vampire Slayer. “Get It Done.” UPN. February 18, 2003. Written and directed by Douglas Petrie. “Buffy the Vampire Slayer – Synopsis.” IMDB.com. http://www.imdb.com/title/tt0118276/. Franke, John R. “’We Hear the Wonders of God in Our Own Languages:’ Exploring the Significance of the Spirit’s Speaking Through Culture.” Cultural Encounters 6, no. 1 (2010): 7-23. Green, Joel B. “In Our Own Languages: Pentecost, Babel, and the Shaping of Christian Community in Acts 2:1-13.” in The Word Leaps the Gap: Essays on Scripture and Theology in Honor of Richard B. Hayes, edited by J. Ross Wagner, C. Kavin Rowe, and A. Katherine Grieb. Grand Rapids: William B. Eerdaman’s Publishing Co., 2008. 198-213. Menzies, Robert P. “The Role of Glossolalia in Luke-Acts.” Asian Journal of Pentecostal Studies 15, no. 2 (2012): 47-72. Sjo, Sofia. “Are Female Messiahs Changing the Trick? Women, Religion, and Power in Popular Culture and Society.” in Reconfiguration: Interdisciplinary Perspectives on Religion in a Post- Secular Society, edited by Stefanie Knauss and Alexander D. Ornella. Krotenthallergasse: LIT Verlag, 2007. 59-72. 1 “Buffy the Vampire Slayer – Synopsis,” IMDB.com, accessed July 24, 2016, http://www.imdb.com/title/tt0118276/. 2 Buffy the Vampire Slayer, “Get It Done,” UPN, February 18, 2003, written and directed by Douglas Petrie. 3 In the “Buffyverse,” as it is called by fans, the potential slayers are girls chosen by Fate to become the Slayer when the previous Slayer dies. 4 Sofia Sjo, “Are Female Messiahs Changing the Trick? Women, Religion, and Power in Popular Culture and Society,” in Reconfiguration: Interdisciplinary Perspectives on Religion in a Post-Secular Society ed. by Stefanie Knauss and Alexander D. Ornella, (Krotenthallergasse: LIT Verlag), 2007, 70. 5 In the “Buffyverse,” the Hellmouth is the opening to the barrier between Earth and hell dimensions, which makes it a natural home to many of the demons and evil forces against which Buffy fights. 6 Buffy the Vampire Slayer, “End of Days,” UPN, May 13, 2003, written by Douglas Petrie and Jane Espenson, directed by Marita Grabiak. 7 Traditionally, only one Slayer can be active at a time. However, upon Buffy’s brief death in “Prophecy Girl (Season 1, Episode 12), another Slayer, Kendra, was activated (Season 2, Episodes 9 and 10). After Kendra is killed in “Becoming, Part I” (Season 2, Episode 21), Faith was activated and became part of the series in “Faith, Hope, and Trick” (Season 3, Episode 3). 8 Buffy the Vampire Slayer, “Chosen,” UPN, May 20, 2003, written and directed by Joss Whedon. 9 Buffy the Vampire Slayer, “Chosen.” 2003. 15 “’Chosen’ Transcript,” BuffyWorld.com, accessed July 24, 2016, http://www.buffyworld.com/buffy/transcripts/144_tran.html. 16 Buffy the Vampire Slayer, “Chosen,” 2003. 18 Robert P. Menzies, “The Role of Glossolalia in Luke-Acts,” Asian Journal of Pentecostal Studies, 15 no. 1 (2012): 52. 19 John R. Franke, “’We Hear the Wonders of God in Our Own Languages:’ Exploring the Significance of the Spirit’s Speaking Through Culture,” Cultural Encounters 6, no. 1 (2010): 18. 20 Buffy the Vampire Slayer, “Chosen,” 2003. 21 Sjo, “Female Messiahs,” 71. 22 Joel B. Green, “In Our Own Languages: Pentecost, Babel, and the Shaping of Christian Community in Acts 2:1-13,” in The Word Leaps the Gap: Essays on Scripture and Theology in Honor of Richard B. Hayes. ed. by J. Ross Wagner, C. Kavin Rowe, and A. Katherine Grieb, (Grand Rapids:William B. Eerdaman’s Publishing Co.), 2008, 212. 23 Green, “In Our Own Languages,” 212. 27 Sjo, “Female Messiahs,” 70.